There have been a few high profile places where the USCG has dropped the ball in the past few years, the Deepwater Project comes quickly to mind, and there are also a few high profile topics that have gained much publicity in maritime circles, the authority of VTS being one, but this article is not about those. This article is about the topics mentioned by average mariners in online forums, training classes and on the bridges of ships. Eloran – For a number of reasons from providing redundancy for GPS navigation to powering the next round of electronic devices, capable of positioning regardless of having a celestial view, eLoran has captured the excitement of gCaptain editors and forum members… that is until recently when the USCG announced the termination of the Loran system. The way to a better future is clearly to invest in technology infrastructure not cut programs with great promise for improved efficiency and safety. eLoran had great potential to improve maritime operations and safety but today it sits here at the top of this list. UAV – Aircraft, both fixed wing and rotary, are critical to providing the level of marine rescue and safety we have come to expect for the USCG but are they doing enough? The use of Unmanned Aerial Vehicles in ocean surveillance, SAR and maritime security is not a new idea to CG acquisitions as the low cost relative to manned aircraft could pave the way for ubiquitous search and rescue monitoring of our shores in weather conditions in which the risk of loosing an aircrew is too high. But, rather than acquire their own network of UAV’s the CG has decided to partner with the Customs and Border Patrol to use their highly expensive Predator Drones. Predators are certainly nice but, in today’s age when military grade UAV’s packed with HD optics and AIS receivers cost less than the average’ master’s yearly salary, why are they not creating their own program? Rescue 21 – Rescue 21 is certainly not a drop of the ball, to the contrary it’s a modern and capable system that has brought rescue coordination into the 21st century. Where the CG has dropped the ball is in developing a program that coordinates between CG assets via high technology but limits mariners to past technology like the VHF radio and DSC. With centuries of maritime experience the masters and pilots of vessels sitting at anchor nationwide are still unable to have a simple conference call between themselves. It’s time for GMDSS to be reinvented to facilitate collaboration among maritime experts both at sea and ashore. In this the CG should be leading the way. Interagency Cooperation and Knowledge – In many areas the work done by the Coast Guard to cooperate with other government agencies has been significant. The work it has done with local and state emergency services post 9/11 is one such example I highly commend. Other examples, like work done with US Customs, is promising. That being said, cooperation between MMS, the agency regulating offshore oil and gas, and the CG needs immediate review. One significant example is the 2008 case of a large exploratory drillship catching fire in the Gulf Of Mexico. Despite the risks involved with having well over 100 persons aboard and operating in a location far from land, the ship had no permanent engine watchstanders or licensed engineering billets of any kind when a fuel leak occurred in the port engine room. The result was a total loss of the space. 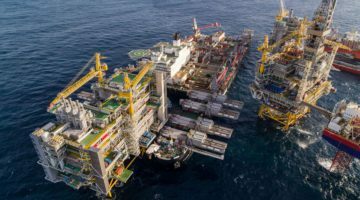 This particular incident occurred after the company was alerted of significant safety and leadership issues by a senior officer, who was removed and eventually terminated by the company. Under rules of questionable effectiveness the fire was reported to MMS who decided to forgo an investigation. That a large ship is allowed by the CG to operate in the Gulf Of Mexico with no watch standers on the Bridge or Engine Control Room is a troubling. That the same ship could have multiple fires, documented complaints by a Sr. Officer, and a catastrophic loss of an engine room without a formal US government investigation or that the flag state, Marshall Islands, did not take significant action is nearly unbelievable. That the Coast Guard did not get involved at any significant level is a matter beyond my level of comprehension. Time-And-A-Half – A captain once told me “If they ain’t writing about you on the bathroom wall, then you ain’t doing your job right” and this item will certainly fill my inbox with complaints from my fellow mariners working offshore (not to mention the IADC!). Why does a mate aboard a tanker, ro-ro or container ship get day for day seatime while one sitting aboard a drillship in one location for months get time and a half. Is it because the dirllship mate is on the bridge of the ship for 12 hours per day while the other splits the same amount of time between the bridge and deck? I don’t have an answer for this and neither does the Coast Guard.